Finally! The stress is over and the mystery solved. 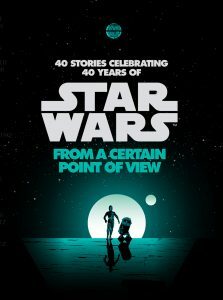 StarWars.com published an article today revealing #OperationBlueMilk to be a book featuring 40 stories from 40 different authors showcasing minor characters experiencing the events from A New Hope we were all captivated by growing up. Del Rey is going to shine the spotlight on those unsung weirdos, heroes, and villains with a unique, new anthology. Star Wars: From a Certain Point of View….will be told from the perspective of background characters of A New Hope — from X-wing pilots who helped Luke destroy the Death Star to the stormtroopers who never quite could find the droids they were looking for. There was a lot of speculation as to what the stories will feature. I, for one, thought Boba Fett would be included and the stories would take place in different parts of the saga timeline. Even Though our speculation is now shattered, I am incredibly excited for this new addition to the amazing Del Rey lineup. I’m just as excited by the lineup of authors who will be contributing their narrative skills to these stories. Just to sample a few, Delilah S. Dawson (“Star Wars: Perfect Weapon”), ,Alexander Freed (“Battlefront: Twlight Company”), Christie Golden (“Dark Disciple”), Chuck Wendig (“Aftermath”), Gary Whitta (“Rogue One”). Well, that’s more than a few, but there’s just so many great minds behind this book! EK Johnston (“Ahsoka”) will co-write a story with Ahsoka herself, Ashley Eckstein. What?! Just when you think Disney and Del Rey couldn’t be more giving by blessing us with these stories, all of the authors are forgoing their pay so that their proceeds can be attributed to First Book, a non-profit that provides books and other education materials to children in need.